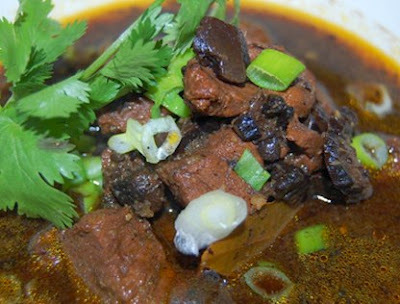 Rawon recipes with meat ingredients that could arouse your taste when whiff and see directly in front of your eyes. These foods ya sometimes make you drool and the like add because it is very rarely I eat, if you want to make a meal just adds on. In terms of taste the sauce alone has become typical because there are very special ingredients and spices. If in my place is a bit expensive so probably around one portion is about 10 thousand more because it uses materials that special meat in small pieces. As we know that this rawon broth rather black and there is a sprinkling of bean sprouts on top. Maybe there are a lot of meat, but the famous rawon comes from the city of Surabaya. So kepngin praktekin try to make yourself right, I also already salivating nih clay. If at first glance does somewhat similar but still different rendang really. Well if you can not wait to know how the manufacturing process then you should consider the immediate yes. Boil water with added lemon grass, lime leaves, bay leaves and lengkaus. Enter daing already cut into pieces, and cook until tender. Stir-fry the spice paste until aromatic, then lift. Enter spice stir earlier into meat stew, add a little salt and sugar. Stir until evenly distributed and mature. If it was cooked, remove and serve.